My excitement for Rustom fell with big thud friday morning when media critics rated the film from average to rank bad. In my preview I did mention a ‘Beware’ section on how Neeraj Pandey the producer’s quality of movies, follows an inverse path to Neeraj Pandey the director. Rustom was expected to have an intriguing plot, real life story, 1960s Bombay, betrayal and heavy media influence. Reminds you of Bombay Velvet – Anurag Kashyap’s 2015 dud? Well, Kashyap’s Velvet seems classic now in front of Rustom. It had better settings, better performances and better story flow. The 1960s setting in Rustom are, well, pure tacky studio sets! Each top view of the court has crowd standing in parallel lines, alternate lines moving in one direction, other alternate lines in opposite direction! Even stage management was poor. The airport where the investigating officer lands is so tacky that you know the aircraft behind is a wallpaper! The two warring families don’t seem to have any friends nor neighbours. I can go on and on about the abysmal level of detailing but that would be unfair to the other lousy parts. 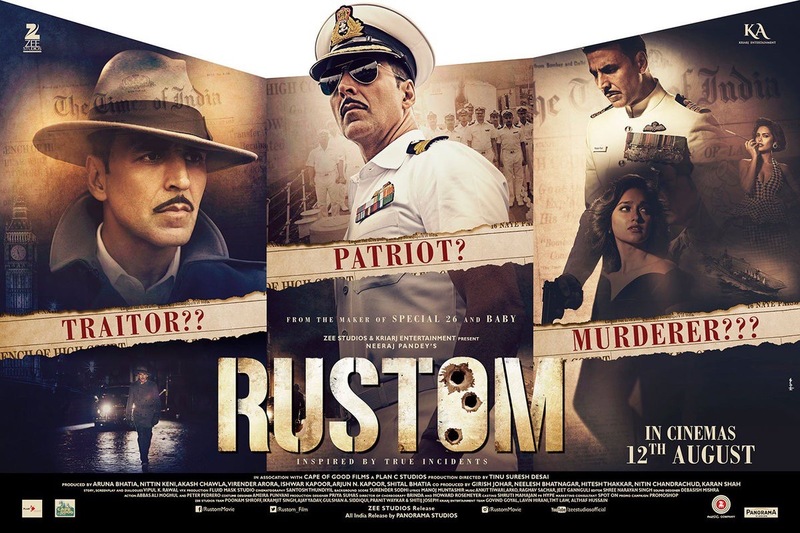 Rustom’s posters proclaimed patriot, traitor or murderer? Well it’s all of them! The only value for your ticket money and evening time comes from Akshay Kumar. Honest and restrained, he tries best to lift a drag 2.5hrs on his shoulders. The poor script and lack of character makes the viewer indifferent – neither feel sympathetic nor judgemental about any character. Kumud Mishra, as the influential newspaper editor, is the only other notable performer and provides the laughs. Editing & screenplay are decent. When Akshay Kumar is not on screen, you can be pardoned for mistaking the ongoings and support cast as part of a B grade film. Ileana D’Cruz has drops of glycerine stuck to her eyes permanently; Esha Gupta a permanent pout. Both look absolutely content and relaxed with perfect pin up hair, modern 2000s dressing and cheeks all pink. This, even when Esha rushes to find his murdered brother; even when Ileana is supposedly going through a harrowing self guilt phase with husband and family future uncertain. The blooming illicit love affair was shown with no logic – except the standard rainfall, ‘pair me moch’ (leg sprained on slipping), wet body, lift up and bingo! Contrastingly, the producers saved money on Akki’s clothes. 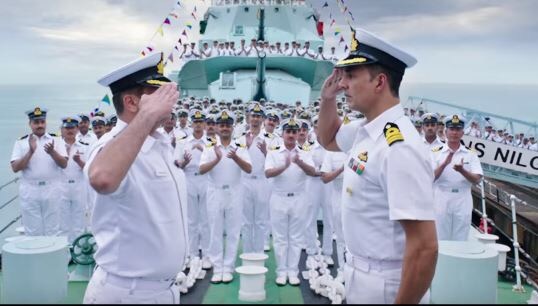 He wears the same naval uniform from opening scene to ending credits, whiter than what ‘Nirma’ or ‘Rin’ washing powder can achieve, ironed and not a speck of dirt. This, even after he stays in an Indian prison for days and weeks. The makers have taken excess liberty from the original Nanavati case. In a yawn 2.5 hrs they showcased the sessions court judgement and proceedings; when in reality there was a subsequent high court appeal, judgement and three years later a mercy petition too. There was enough scope to fit all of it and make the movie better. Instead we have a fictitious blackmail plot put it to zero effect. The original 1959 Nanavati case was about a trustworthy best friend cheating and the impact of betrayal. Here no effort is made to showcase the friendship and hence the grey element conveniently wiped out. Instead, each key witness, lawyer and judge are turned into caricatures with tendency to shriek, lecture and gesticulate wildly at every chance. The audience got some laughs during the court scenes but the farcical settings intercepted by random songs missed the whole point of India’s first media trial which turned into massive issue between Bombay’s two richest communities. Box Office Prediction: Akshay’s pull will get the movie to gross around the 70-90 cr mark; the makers should hand over 99% of that collection to Akshay Kumar. Seriously. Pull out Akki and replace with a second rung hero and the cash register won’t even clock in double digit crores. It’s a big opportunity missed and the makers harmed the end product no end.